The NETGEAR® Gigabit Unmanaged Switch series helps businesses costeffectively increase power budget to expand their network. Powered by the industry's first flexible PoE+ integrated technology, you can increase or decrease the PoE budget by simply buying a new power supply, effectively futureproofing small business networks and budgets. All ports support PoE/PoE+ that makes them the perfect switches for deploying Wireless APs, Pan/Tilt/Zoom and fixed IP Cameras, VoIP Phones, access-limited security door locks or any other IoT PoE-powered devices. The GS108LP, GS108PP, GS116LP and GS116PP Gigabit Ethernet switches come with 8 and 16 Gigabit copper ports in a desktop metal case. The small form factor combined with the rack-mount and wall-mount accessories give you the flexibility to place these switches in small cabinets, in a 19" rack, on a wall or on your desk. All ports supports PoE+ and PoE being able to provide up to 30W per port to any power-hungry device (PTZ Cameras, PoE Lights, PD Switches, Access Points). Adapts to your needs and configuration and configuration in any environment. Rackmount, wall or desktop mounting options. Interchangeable External Power Supply. Increase or decrease your PoE Budget as needed. Small form factor and silent for quiet operation makes it the ideal switch for noise-sensitive environments. The following table describes the PoE classes and switch allocations. 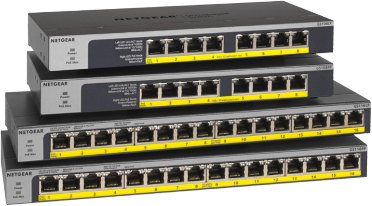 Download the NETGEAR 8-port and 16-port Gigabit Ethernet Unmanaged PoE/PoE+ Switches Datasheet (PDF).